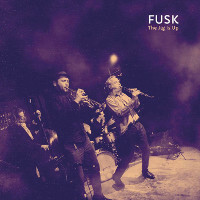 This is the fourth album by the European Jazz quartet FUSK, led by Danish drummer/composer Kasper Tom Christiansen, which also includes for the first time Polish trumpeter Tomasz Dąbrowski, and founding members: German bass clarinetist Rudi Mahall and Danish bassist Andreas Lang. The album presents ten original compositions, all by the leader. Christiansen and Dąbrowski cooperated and recorded together many times in the past and therefore the fact that Dąbrowski joined the quartet is only natural, replacing German saxophonist Philipp Gropper, who was a member since the inception of the quartet. Although the music of FUSK is first and foremost a reflection of Christianson's compositions, the presence of Dąbrowski changed the internal balance and the overall sound of the quartet, taking it slightly back towards the American Jazz tradition and the early Free Jazz explorations of the late 1950s and early 1960s. Of course it is only one of the many aspects of this music as a whole and FUSK retains all its European Jazz qualities, but at the same time pays tribute to the Free Movement innovators. As usual, the music is based on highly complex and yet wonderfully melodic themes, which Christianson so ably creates, which in turn provide ideal platform for the quartet members to develop their individual and collective statements. The beautiful bass clarinet/trumpet double parts are one of the highlights of this album, as both Dąbrowski and Mahall are able to keep an almost "romantic" form of dialogue between them, which is intriguing without being aggressive. Lang and Christiansen are a highly sensitive and technically fabulous rhythm section, which is standing shoulder to shoulder with the two soloists, participating equally in the process of group improvisation and mutual creation. The scope of the compositions, and as a result the scope of the music presented on the album is very diverse, which creates an element of tension with the listener not sure as of what to expect next. The music movies in and out between the improvised and precisely composed parts, often several times within the same track, with the rhythmic parts changing from no time to almost swinging time in an blink of an eye. However a blissful and relaxed feeling of order and coherence is present at all times and the music never falls apart in spite of its intricacy. For an experienced Jazz connoisseur this album is a lecture of Jazz, and especially Free Jazz history, delightfully illustrated by the music. Not surprisingly it is a wonderful piece of music, which should be enjoyed by as many listeners as possible and another milestone in Christiansen's path, which is one of the most consistently excellent on the burgeoning European Jazz scene. Hats off, again, Maestro!